Paaaah a gimmick - I believe the process of experimenting with different damping rates by having to completely strip down the shock, removing and inevitably losing the e-clips, fitting another holed disc and then replacing the oil - only to find you need to use the three hole disk and a different oil and have to go through the whole process again eight times again (for each damper) is the future. Actually thats a very good idea! Nice! I'm sure Tamiya will follow this idea or make it a little different if Yeah Racing patented their design. Am I the only one who tired to see yeah racing parts? Edit: must have been due to early morning awakening haha. I like yeah racing parts they seem affordable more then others. But I am suspicious about the durability. 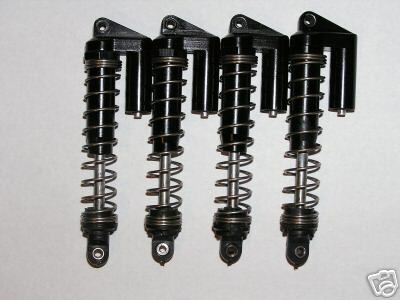 It’s been done before, progressive suspension made shocks for RC probably 15 years ago now that had rotating internal piston. The design was different to this though they had a shaft inside another shaft so you could turn one part of the piston, the spring cup was the adjuster you turned while holding the eyelet. The piggybacks where functional, but where filled with a foam to allow compression compensation. For whatever reason they never took off, they where very expensive. Juls1 is right, it's been done before. On my 20 year old Corally C4 you can adjust the damping by pulling down the shaft to lock it and then twist the end to rotate the internals. I've always thought it was a great idea, I'll definitely get a set of these to tinker with. That's neat - although I imagine it's easy to 'forget' where your current setting is and end up with different shock rates on different corners. I wonder how many of us have sensitive enough hands to tell a shock rate but manually compressing a shock? I can't tell the difference between a hard and a soft TRF spring by hand. It can be noticable, I have rebuild some Yokomo BD5 shocks with 2hole piston to a tamiya 3hole piston and they are same diameter just the 2hole pistons from yokomo were much thicker, they worked harder. So did my old Xray T1. There were 4 positions, I think, and a noticeable "click" between each one, so if you forgot where you were, you just went all the way to one end and counted the clicks. I wonder how each setting on the piston changes the damping characteristics... Are you seeing the equivalent of a 50 cst or 100 cst oil change with the change in holes? Or is it much more coarse, like 200 or 300 cst per hole? Also, when altering the number of holes for the exact same oil the peak flow rate of oil per hole changes, which changes whether dampers generate any "pack." Normally with TRF-style dampers they produce a force related to shaft speed up to a certain point, and then higher shaft speeds produce exponentially higher forces. There's this figure called the Reynolds number that depends on piston thickness and hole diameter which defines when the damper transitions from linear forces to "pack.". So when changing the number of holes in the piston, each hole has the same Reynolds number but the oil flow rate is divided over more or fewer holes. You may notice that TRF-style dampers usually have pistons with different hole counts and different hole diameters. You can maintain similar linear damping forces but change the threshold for packing up by swapping hole sizes and oil weights (smaller holes, thinner oil = more pack; bigger holes, thicker oil = less pack). I'm thinking @Superluminal in his first post is right; these look like a gimmick at first glance. If you really are tuning for some specific conditions, then you probably still have to open these up to change oil and pick hole count / hole sizes. There's no harm in trying these, but they may not let you dial in the suspension as well as they imply when used as shown. Pretty sure I had something similar on my Schumacher Bosscat & Cat2000 back in about ‘92/93 as well! My old Kyosho Platinums were externally adjustable back in the late '80s. The shaft was so thick that there wasn't enough volume compensation with bladders. Really cool idea that didn't work.